The mega-bestseller with more than 1.5 million readers that is soon to be a major television series "The novel buzzes with the energy of numerous adventures, love affairs, [and] twists of fate." --The Wall Street Journal He can't leave his hotel. You won't want to. From the New York Times bestselling author of Rules of Civility--a transporting novel about a man who is ordered to spend the rest of his life inside a luxury hotel. In 1922, Count Alexander Rostov is deemed an unrepentant aristocrat by a Bolshevik tribunal, and is sentenced to house arrest in the Metropol, a grand hotel across the street from the Kremlin. Rostov, an indomitable man of erudition and wit, has never worked a day in his life, and must now live in an attic room while some of the most tumultuous decades in Russian history are unfolding outside the hotel's doors. Unexpectedly, his reduced circumstances provide him entry into a much larger world of emotional discovery. Brimming with humor, a glittering cast of characters, and one beautifully rendered scene after another, this singular novel casts a spell as it relates the count's endeavor to gain a deeper understanding of what it means to be a man of purpose. "How delightful that in an era as crude as ours this finely composed novel stretches out with old-World elegance." --The Washington Post "Marvelous." "The novel buzzes with the energy of numerous adventures, love affairs, twists of fate and silly antics." --The Wall Street Journal "A winning, stylish novel." --Seattle Times "The perfect book to curl up with while the world goes by outside your window." --Refinery29 "Who will save Rostov from the intrusions of state if not the seamstresses, chefs, bartenders and doormen? In the end, Towles's greatest narrative effect is not the moments of wonder and synchronicity but the generous transformation of these peripheral workers, over the course of decades, into confidants, equals and, finally, friends. With them around, a life sentence in these gilded halls might make Rostov the luckiest man in Russia." "This is an old fashioned sort of romance, filled with delicious detail. Save this precious book for times you really, really want to escape reality." --Louise Erdrich "Towles gets good mileage from the considerable charm of his protagonist and the peculiar world he inhabits." --The New Yorker "Irresistible . . . In his second elegant period piece, Towles continues to explore the question of how a person can lead an authentic life in a time when mere survival is a feat in itself . . . Towles's tale, as lavishly filigreed as a Fabergé egg, gleams with nostalgia for the golden age of Tolstoy and Turgenev." "'The Grand Budapest Hotel' and 'Eloise' meets all the Bond villains." --TheSkimm "And the intrigue! . . . [A Gentleman in Moscow] is laced with sparkling threads (they will tie up) and tokens (they will matter): special keys, secret compartments, gold coins, vials of coveted liquid, old-fashioned pistols, duels and scars, hidden assignations (discreet and smoky), stolen passports, a ruby necklace, mysterious letters on elegant hotel stationery . . . a luscious stage set, backdrop for a downright Casablanca-like drama." 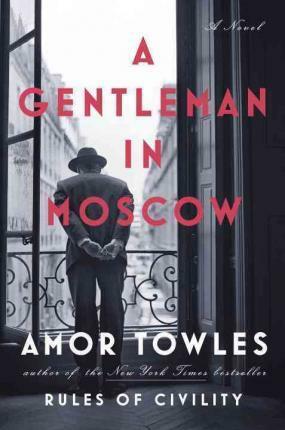 --The San Francisco Chronicle "The same gorgeous, layered richness that marked Towles' debut, Rules of Civility, shapes [A Gentleman in Moscow]." --Entertainment Weekly Praise for Rules of Civility "An irresistible and astonishingly assured debut." "With this snappy period piece, Towles resurrects the cinematic black-and-white Manhattan of the golden age...[his] characters are youthful Americans in tricky times, trying to create authentic lives." "Put on some Billie Holiday, pour a dry martini and immerse yourself in the eventful life of Katey Kontent." "Glittering...filled with snappy dialogue, sharp observations and an array of terrifically drawn characters...Towles writes with grace and verve about the mores and manners of a society on the cusp of radical change." --NPR.org "A book that enchants on first reading and only improves on the second."